UPDATED 11:22 A.M. EDT (JUNE 13, U.S.A.) Images of a man described as “Alan Chapman” appear in online promos for both the JSS Tripler/JustBeenPaid and Zeek Rewards “programs” that plant the seed that enormous daily returns on the order of 1 percent to 2 percent are possible. Zeek members who want to share in the firm’s purported revenue pool are required to post an ad online to qualify for a payout. The ad-posting requirement may be a bid to undermine the “Howey Test,” which determines what constitutes a security/investment contract. One of the questions posed by the Howey Test is whether profits can be derived from an opportunity solely from the efforts of the purveyors. 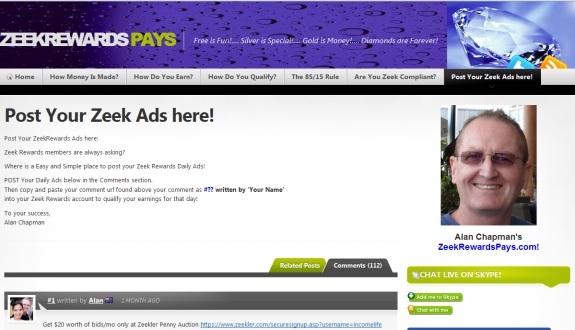 By insisting that Zeek members cannot get paid unless they post an ad, Zeek may be setting the stage to argue that Zeek’s ad-posting requirement constitutes “work” by affiliates and therefore the payouts do not derive solely from Zeek’s efforts. Both Zeek and JSS/JBP use offshore payment processors such as AlertPay (now Payza) and SolidTrustPay that are friendly to fraud schemes promoted on known Ponzi-scheme forums such as TalkGold and MoneyMakerGroup. Both Zeek and JSS/JBP have promoters in common, and both “programs” are being promoted on the Ponzi boards. Because Zeek and JSS/JBP have common promoters and a presence on Intenet cesspits, questions have been raised about whether the “programs” and their banks and payment-processing vendors have come into possession of funds tainted by fraud schemes. ZeekRewards Daily Profit Last 7 Days! JSS/JBP also has banned discussion about customer-service issues on its weekly conference call. That announcement was made during the June 7 call, a week after a woman identified as “Ping” begged Mann for assistance, asserting her concerns had not been addressed in a month. During the June 7 call, Mann also implied that JSS/JBP members were free to start their own business-with-a-business — for example, they could create pools from investor money at the local, regional, national or international level and a single JSS/JBP member could manage the pools and perhaps make a profit by playing the spread between what JSS/JBP pays and the fees a local pool manager would charge for managing the pool. JSS/JBP has no known securities registrations, does not identify where it is operating from and may have ties to the “sovereign citizens” movement. Mann now has taken to doling out medical advice during the JSS/JBP calls, insisting that JSS/JBP members should not trust their doctors. Nor should they trust attorneys, Mann implied. Zeek recently has encountered problems at at least two U.S. banks. Zeek preemptively has denied it is a pyramid scheme. The firm also claims it is not offering an investment product. 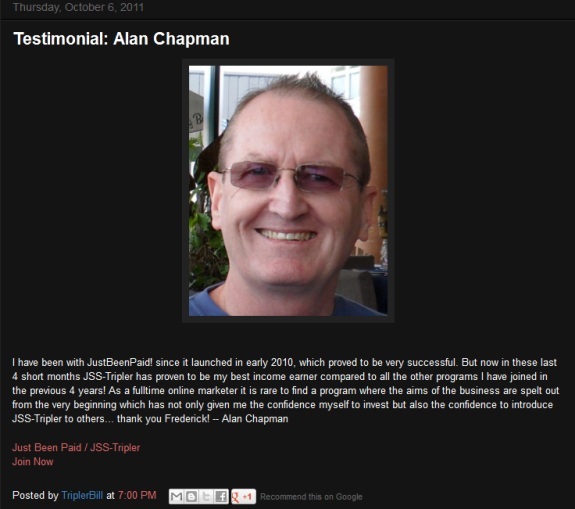 Aha, the serial scamming, New Zealand based Alan Chapman strikes again. Gold Bullion Savings Plan” “Alans’ Report” and “High Yield Programs Research” fame. 2) Which clearly proves the activity is completely inconsequential thus it does not defeat the Howey test at all… just like Andy “ASD” Bowdoin’s claim that “click on ads / watching ads” was bogus. I believe he tried to claim that defeats the Howie test as well. 3) You now have serial MLMers going after other MLMers to “conspire” to “cheat” (or “game”) Zeek’s comp model. 5) But Zeek don’t want complainers and people asking questions. THEY should leave the company, according to its official rep on its official support forum. Translation: Zeek only wants sheep (who don’t ask questions) and schemers (who can bring in more sheep). Okay…..this was a nice surprise today…. I got paid from W4LR…..that means I have 5 referrals….at least 5 levels deep….promoting in autosurf paid off, and I have already my deposit out…..really this is…$2 just for fun!! Why do I get the feeling that Alan Chapman is New Zealand’s Ken Russo? Just learned that Zeek is tired of us reading their support forum so they’re going to hide it behind member wall. Couldn’t you just register as a free affiliate and read the support page? What difference does it make other than hiding it from Google indexing? No one ever claimed HYIPers were the smartest or most tech savvy bunch on the ‘net. K. Chang: Just learned that Zeek is tired of us reading their support forum so they’re going to hide it behind member wall. And who could forget AdSurfDaily-related AdViewGlobal? It would be interesting to know how many members ASD, AVG and Zeek have in common. And TVI Express. I found Dave Kettner advertising ZeekRewards as well, among others. I think TVI Express member Ross Kaspi is allowing her team member Verlyn Spreeman to advertise Zeekler on her site. Daryle Douglas, 3rd of the Zeek Triumvirate, was owner of MyBidShack, that apparently pioneered the “50% profit back to affiliates in a matrix” comp model married to a penny auction. Darryle Douglas’ and Paul Burks’ association goes way back at least to 2006 when they operated the “NewNetMail” scam from the Lexington address. Leopards changing spots, and all that. Got a reply back: Rex Venture Group, i.e. Zeekler, didn’t get an auction license until March 2012, even though they had been conducting auctions in North Carolina since… March 2011. Their current auction license# is 9041 issued to Rex Venture Group. So they are legal, as of now.